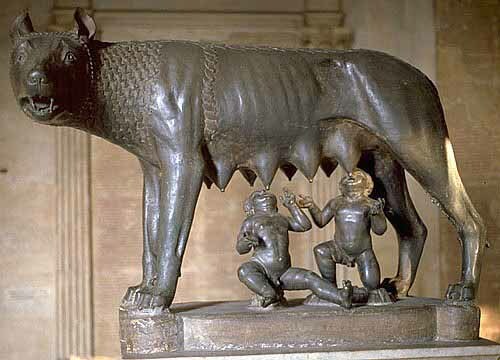 The second myth of the founding of Rome is the legend of the twin boys named Romulus and Remus. Romulus and Remus are the twin boys that were born to the god Mars and the mortal Rhea Silvia. When the twins were born they were placed in a basket to float down the Tiber River and to die. They were placed there by their great uncle because he did not want them to be a threat to his power. The twins were found by a she-wolf and the wolf raised them. The she-wolf raised them until one day a shepherd named Faustulus and his wife found the boys. They then raised the twins as if they were their own. Years later when the twins were old enough they decided to found their own city. Romulus and Remus looked to the sky and to the birds. After seeing the signs they saw that Romulus' section of the city would be twice the size of Remus'. The twins quarreled and Remus was either killed by Romulus or just disappeared. Romulus did continue to build up his city, which was named Rome. In conclusion there are two very different myths about the founding of Rome. One to do with a Trojan Prince and the other to do with wolf raised twin boys. Both of these myths have survived throughout the centuries to be very well known. Marks, Anthony, and Graham Tingay. The Romans. Usborne. London. 1990.